The Parsonage, Adoration Room and Canteen are now closed for the first phase of our renovation works. Hoarding has been erected; for your own safety, please do not enter the worksite. Please follow the directional signages and instructions by the wardens and let us ask our Lord to guide all involved in this rebuilding, for safety for all and to give us hearts of patience, understanding and love to see this project through. We have officially begun our efforts to raise $2.3 million to partially fund the much-needed renovations to our church facilities. Do keep a look out for the exciting activities planned to not only raise funds but also to build community spirit and foster fellowship! Those who wish to organise any fundraising activities should email renofund@sfxchurch.sg, before commencing any activities. For any enquiries related to the renovation itself, please email our Parish Building Committee at reno@sfxchurch.sg. 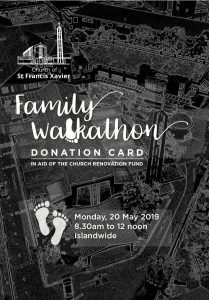 If you would like to make a donation towards the Parish Renovation project, please take an envelope from our Parish Office, as well as two other forms. The first form tells us how you wish to contribute. The second form is an application for GIRO payments. The forms are available online and at the entrance of the Church. 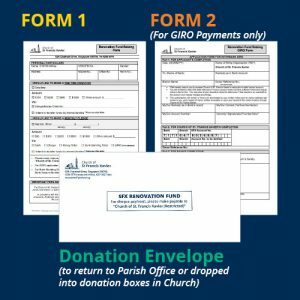 Please seal the completed forms into the envelope, together with your contribution, and return it to the Parish Office. Alternatively, you can drop the envelope into the steel donation box located at the church entrance of front foyer. A big thank you to all of you for your kind support and contributions! * Kindly note that all fundraising activities are confined to within the SFX Church community and friends only. Persons will need to be authorized by the committee to solicit donations. Please be cautious in entertaining anyone soliciting money for our renovation fundraising. Existing air conditioning system is more than 15 years old and is not energy efficient. Lighting in Main Church is not consistent with difference in lighting in the centre and at the side. Pews are scratched and kneelers are old. There are roof leaks in Main Church and Sacristy. Cupboards in Sacristy are worn out. Water feature at sanctuary back wall is not functioning. Main Church, Parish Centre and Parsonage not connected. A total of five different levels at current Plaza, making it inconvenient and difficult for parishioners and guests in wheelchairs, with prams or even the elderly to navigate. Steps become a hazard for the elderly especially when it rains. Located in the middle of the driveway, “Our Lady of Grace” Grotto is not easily accessible when it is raining. It is also not wheelchair-accessible. Vehicles that drive past the Grotto can disrupt prayers and may compromise safety. Modular furniture with flexible spaces allow for easily reconfiguration of spaces for various needs – study area, meeting/break-out room, community events, camps etc. Priests’ living quarters are in need of renovation with leaking roofs and mould in their rooms. We are undertaking a project to renovate and upgrade our church to make it a more inviting and inclusive place, and also to cater for the growing population of our Parish. Pamphlets containing more details on the project can be downloaded here, or found outside our Parish Office. 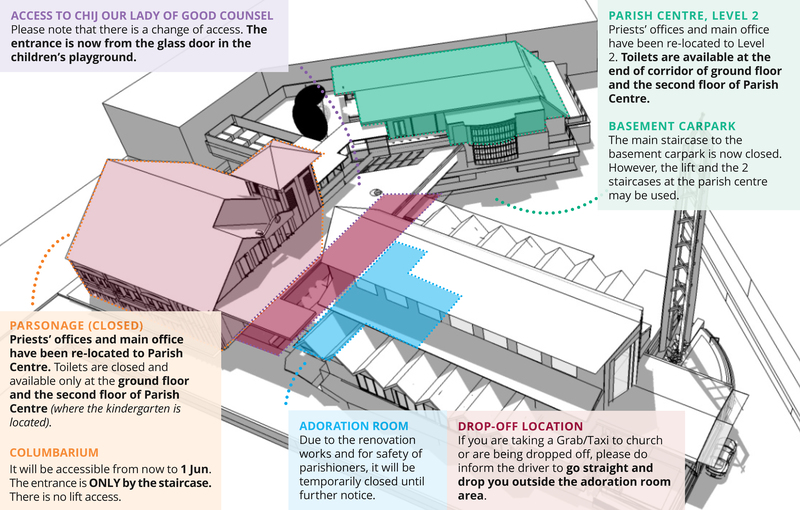 This Parish Renovation Project is estimated to cost a total of S$6.8 million, where S$4.5 million will be taken from the Church's reserve, and S$2.3 million shall be raised through donations. Fundraising has begun and activities will be announced over the course of the next few months. For enquiries about the renovation, email our Parish Building Committee at reno@sfxchurch.sg. 1. What must I write behind the cheque made out to “Church of St. Francis Xavier (Restricted)”? It is important that the words “SFX Renovation Fund” be written at the back of each cheque. This will help in ensuring that such funds are directed to the Renovation programme. 2. Can I make a contribution in cash? Yes! Please fill up the SFX Renovation Donation Form with your contact details, indicating the amount of cash you are donating. Then put both the form and the cash into the envelopes marked with “SFX Renovation Fund” and return it to the church office or put into any of the Church donation boxes. 3. Are contributions tax deductible? 4. For internet transfers (via FAST), the account number does not seem to work. Please note that the first 4-digits 7171 is the DBS Bank code. If you are transferring via FAST, you do not need to use these four digits. Simply, use the account number 047-9036997.